Tuesday night: double spinfit night and I got a text from our usual spin instructor Helen saying her cover had phoned to say she couldn’t make it. Helen is laid up with a broken leg just now, so we had no instructor. I thought we might have been able to use the spin bikes, we’ve done that before, but apparently not. So I went upstairs in Bella to the bikes in the gym along with a few other girls from spin. The 20 minute limit on cardio machines was blown out of the water for all of us, as we aimed to do between an hour and 2 x 45 minute sessions! If they didn’t like it they should have let us on the spin bikes downstairs! The next workout was cut by 15 minute to 30 minutes, as I’d had enough by that point, but I did the following. It would have been better if we’d have been able to go on the spin bikes, and perhaps I should have pushed the matter a bit futher. The fact is double spinfit is hard enough, and it’s even harder if you don’t have someone shouting at you to push you that little bit more than you would push yourself. That’s 5 weeks since Helen broke her leg… hopefully it’ll be better soon as we miss her. 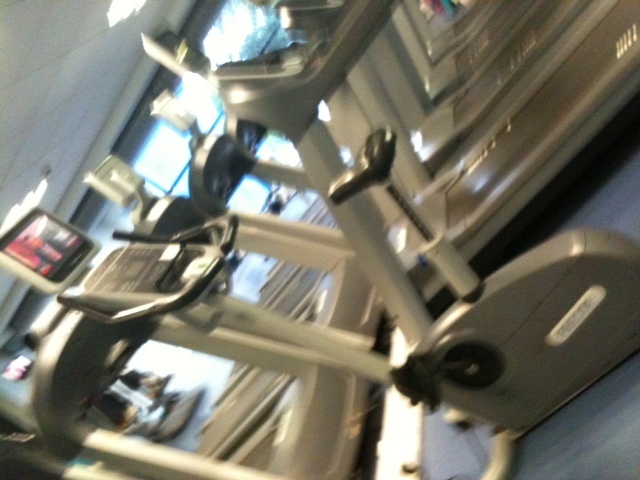 This entry was posted in Bike, Bike Workout, Spinfit and tagged bike, gym, helen, spin, spinfit, sweat. Bookmark the permalink.